Evylena Nunn Miller in her studio located off of Sunset Blvd in LA, around the 1920's, or 30's. Evylena Nunn Miller was born on July 4, 1888 in Mayfield, Kansas where she spent the first fifteen years of her life. In 1903 she moved to California where she first studied art at Occidental College in Whittier and then earned her B.A. degree from Pomona College and her teacher’s certificate from UCLA. She also attended the Art Students League in New York City and the Berkshire Summer School of Art. 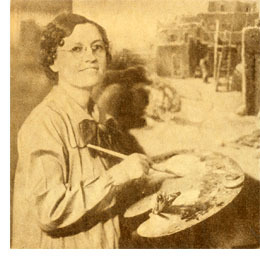 From 1911 until 1918 Evylena taught art at Claremont High School, Riverside Girls High School and Santa Ana High School. During this period she further studied with Anna Althea Hills and Hannah Tempest Jenkins. From 1920 to 1922 she taught at a boys school in Japan while studying privately with Jippo Araki. She later returned to the United States where in 1923 she married Howard Earl Miller who shared her love of travel. Evylena and Howard lived in Los Angeles and, with her painting landscapes, coastal views and Native Americans, they traveled widely, including to Arizona, New Mexico, Utah and Colorado. One of her goals was to paint all of the pueblos of the Southwest and, pursuing that as well as landscape subjects, they forded rivers, with into building ruins, and climbed high elevations. These pursuits led to the completion of forty canvases of scenes of life in the pueblos of the Navajo, Apache, Toas, Hopi, Jemez, Acoma, Laguna and Zuni. Later she also painted in Japan, China, Egypt and the Holy Lands and in 1933, her book Travel Tree about these journeys was published. Evylena Nunn Miller, around late 1940's, or early 1950's. "This picture is what I remember of her, but with more grey hair. Also, the painting looks like the Palm Spring area of California." - said Evylena's grand-niece, Georgiana Gorman. 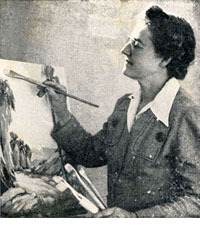 In 1956 Evylena became the director of the Bowers Memorial Museum in Santa Ana. In addition she was a member of the Women Painters of the West, the Foundation of Western Artists, the Los Angeles Art Association, the National Association of Women Artists, the California Art Club and the Laguna Beach Art Association. She died in Santa Ana on February 25, 1966 having exhibited widely, including the National Art Gallery, the Smithsonian, the Pasadena Art Institute, the San Diego Find Arts Gallery and the California Art Club. She has works held at the Bowers Memorial Museum, the Chinese YMCA (San Francisco), the First Presbyterian Church of Santa Ana, Pomona College and the Orange County (CA) Museum. Sources: Archives of AskArt; Edan Hughes: Artists in California, 1786-1940; Phil and Marian Yoshiki Kovinick: An Encyclopedia of Women Artists of the American West, and various Gallery publications. Photos and captions of Evylena Nunn Miller were contributed by her grand-niece, Georgiana Gorman, in February, 2013.